Readers, I think I’ve found it. The best gaming headset. For me, anyway. Thanks to a simple strip of fabric, Steelseries’ Arctis 7 is hands down the most comfortable gaming headset I’ve ever used. Instead of cushioning that damnable headband with memory foam and other such gubbins you normally find in online mattress ads, Steelseries’ so-called ‘ski-goggle’ design puts all the weight on a stretchy piece of material that wraps tightly, but snugly round your skull, while the main aluminium frame sits suspended above your head. No pinching, no headache, nothing. It’s beautiful. You can adjust the tautness of the fabric with its tough velcro fastening on the side should it prove too small or large out of the box, and you can even buy additional bands to spice up its design should you feel like a change. 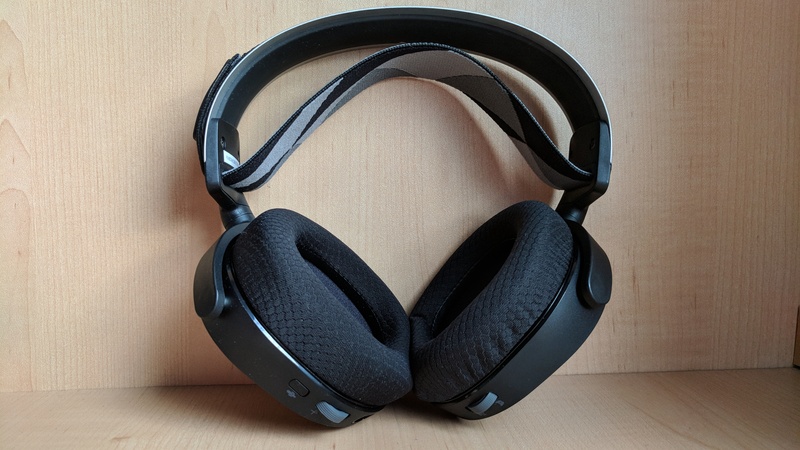 Combine that with two supremely soft ear cups, great wireless audio, a swathe of controls and the fact it costs just £135 (or £100 over at Amazon at time of writing) – a relative bargain compared to the Steelseries’ equally good but £200+ Siberia 800 – and the Arctis 7 makes a great first impression. Indeed, having spent many hours listening to both this and the Siberia 800 in quick succession, its audio quality is nigh on identical. I certainly couldn’t tell much of a difference between them, as everything from soundtracks to in-game audio sounded just as clear and balanced as the other. What the Arctis 7 lacks, of course, is the Siberia’s fancy-pants receiver box, opting instead for a simple USB transmitter. The long cable provides a bit of flexibility, giving you the freedom to place it on your desk to improve its range rather than have it collecting dust behind your PC, but it’s still fundamentally a USB dongle. You also get a 3.5mm analogue cable for wired use, plus a micro USB cable for charging, but that’s pretty much it. No special chat cables and certainly no optical S/PDIF. Not that that really matters, as the Siberia 800 was, in all honesty, a bit of a faff to set up. The Arctis 7, on the other hand, is much simpler. You just plug it in, and you’re more or less off. Okay, I had to download some drivers using Steelseries’ Engine software before I could actually start using them, but that’s much less painful than fiddling about with the Siberia 800’s box menu and setting up each individual source one by one. Engine also lets you enable the Arctis 7’s DTS X 7.1 surround sound feature, but I wouldn’t recommend it. As discussed in my Siberia 800 review, any kind of surround sound support – especially 7.1 – is all a bit of a fudge when it comes to headphones, as you’ve still fundamentally only got two speakers instead of seven and a subwoofer. Instead, it’s all done virtually via software, which can be a bit spotty depending on what kind of standard it’s using. In the Arctis 7’s case, I found turning on DTS X only made music sound a bit fake and synthetic, so I left it turned off. I also didn’t feel the need to mess with Engine’s onboard equaliser nonsense, and its three preset modes (Game, Movie and Music) all sounded much of a muchness. As a result, I left it in the default Game mode. The retractable mic can also be adjusted via Engine. Here, you can adjust the volume and sidetone (how much you can hear your own voice when speaking into the microphone), but once you’ve configured it to your liking, you shouldn’t have to open it again. Indeed, I found the default settings to be plenty good enough, and the mic was a heck of a lot clearer and less muffly than the one on the Siberia 800. In fact, I’d even go as far as saying it was as good as, if not better, than the Sennheiser GSP 350‘s microphone, particularly as the Arctis 7’s mute button on the left ear cup turns the mic a cheeky shade of red to let you know it’s not in use – a huge improvement on simply lifting the mic arm up towards your head and constantly second-guessing whether you’ve done it right or not. Admittedly, the microphone’s background noise cancellation could use a bit of improvement, as I could still hear myself typing and clicking my mouse while I was testing it, but on the whole, it puts in a respectable performance. You even get a music and chat mix slider on the right ear cup, too, letting you dial down a game’s background music so you can focus entirely on multiplayer chat, or filter out those screaming 12-year-olds entirely if you’d rather concentrate on those thumping victory tunes. Did I also mention just how comfy it is? For me, that’s what really seals the deal on the Arctis 7. The fact it sounds great and has an excellent microphone is just a bonus at this point, as I’ve never found anything I can wear for more than an hour in all my years of headphone testing. I could easily wear these all day without batting an eyelid, and its closed-back design means you can also use it around other people without grating on everyone’s nerves. As such, I’d heartily recommend the Arctis 7 to anyone who values comfort as much as I do. Of course, if you don’t fancy spending this much on a wireless headset, or just want a plain, old wired one, the good news is that the rest of the Arctis series has exactly the same design and uses exactly the same audio drivers as its flagship cousin, guaranteeing a near-identical listening experience minus a few features. The wired £110 Arctis 5, for instance, can be used over USB and 3.5mm analogue and comes with RGB lighting on the ear cups, or you can get the entry-level Arctis 3, which just has a regular 3.5mm connection for £90. 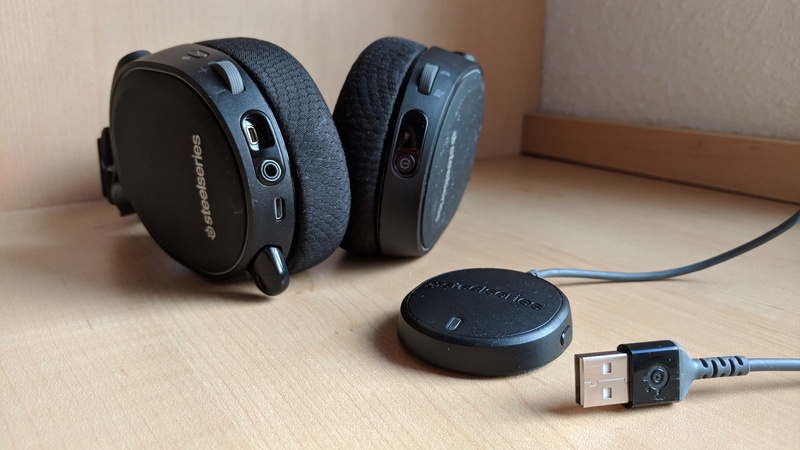 The latter is also available as a £135 wireless Bluetooth headset, but it’s worth bearing in mind that neither Arctis 3 model comes with the chat mix feature. Whatever model you decide to go with, though, there’s no denying that Steelseries’ Arctis range is a tough act to follow. The Arctis 7 in particular is now my headset of choice for overall comfort, and future headsets will have to work very hard indeed to knock it off its throne. Tagged with best thing, feature, Hardware, Headsets.